With my first official week of Crossfit out of the way its time for the review. The first session for the week was a Monday evening. For our first official WOD we were faced with Elizabeth, inspiration from Warnie here. Liz brings with her; 21-15-9 Reps for time of Squat Clean 60 / 40kg & Ring Dips. Still being beginners our workout was scaled so we could actually complete it. This is normal if some of the exercises are beyond your limitations. The pictures below show our full workout for the night including warmup and times with weight used and assistance (resistance bands). 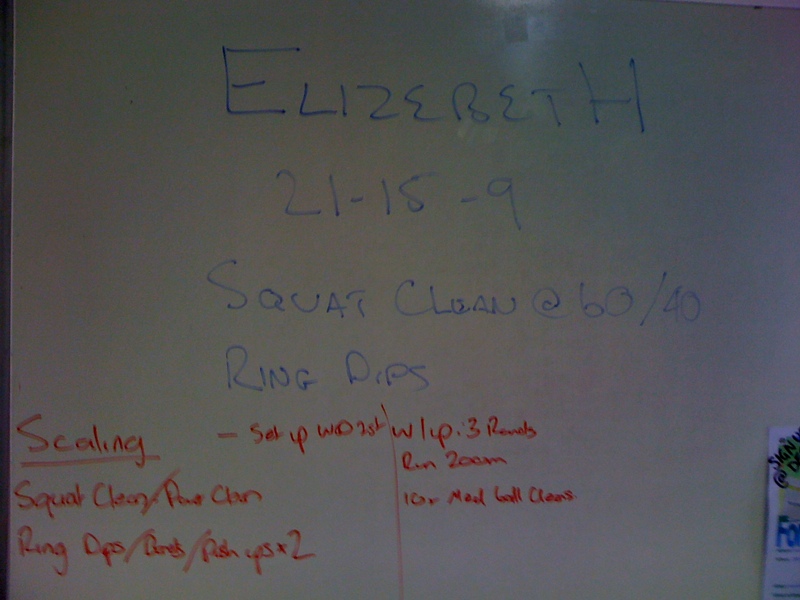 I managed to complete Elizabeth in 10:48 with 40kg on the squats and the red & yellow band for the dips. Session two for the week was a Wednesday evening Squat fest. This involved 5-3-3-1-1-1-1 Front Squats with a 20 minute time cap, increasing weight across sets or until failure. I started with a warm up of 40kg x5 and progressed from there. My first single set max was for 80kg, this felt a lil easy so went for 85kg on the 2nd. A bit harder but still felt i could get more. I pushed hte 3rd to 90kg. Well that extra 5kg felt like 100kg, on the lift the legs started to jelly but I somehow got up. The fourth was a go for broke set, I aimed for 95kg. This time that extra 5kg may have been 100kg. I reached the bottom of the squat but couldn’t get the lift, my legs went to jelly and it was all over, I had found my max. Tonight(Friday) was the 3rd and final session for the week. 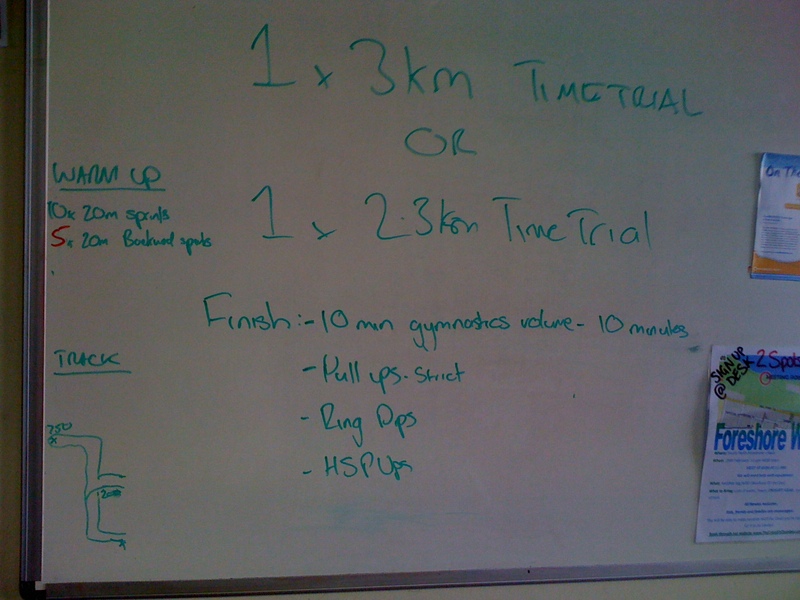 Chad had a 3km run time trial organised for us. Great I love running….NOT!!! and nor do my shins. My alternative was a 3km row. Not as easy as it sounds but definitely less painful to my body. Our warm up involved 10x 20m sprints followed by 5x running backwards sprints. 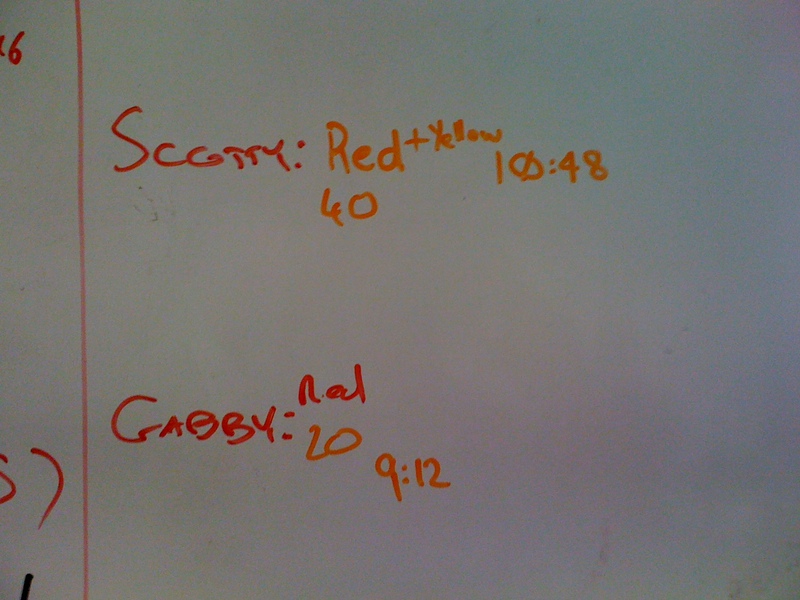 Then we started the time trial. 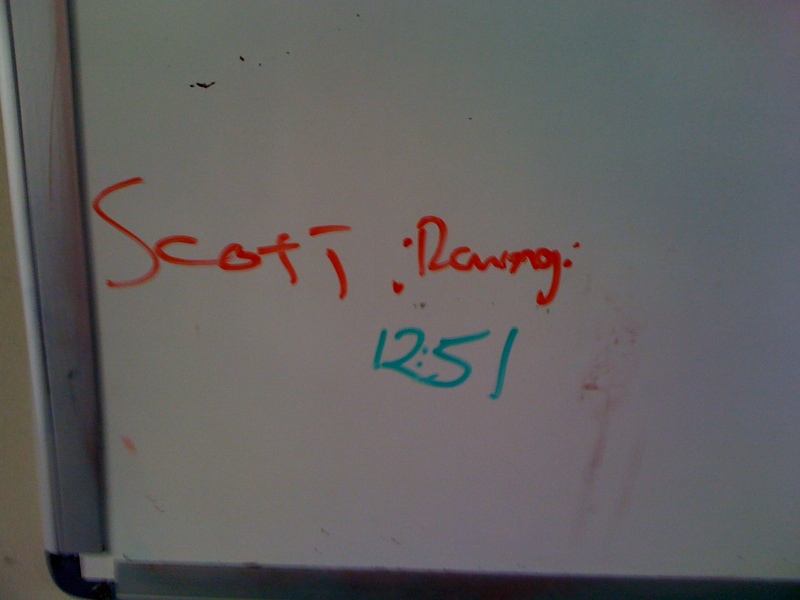 I managed a 12:51 for the 3km row, apparently not bad for a first time. I now have a baseline to work from. The 3km time trial was followed by 10 mins of gymnastics volume training with 3 choices of exercises, Pullups, Ring Dips or Handstand Pushups. I went with the ring dips as I knew I could manage these. 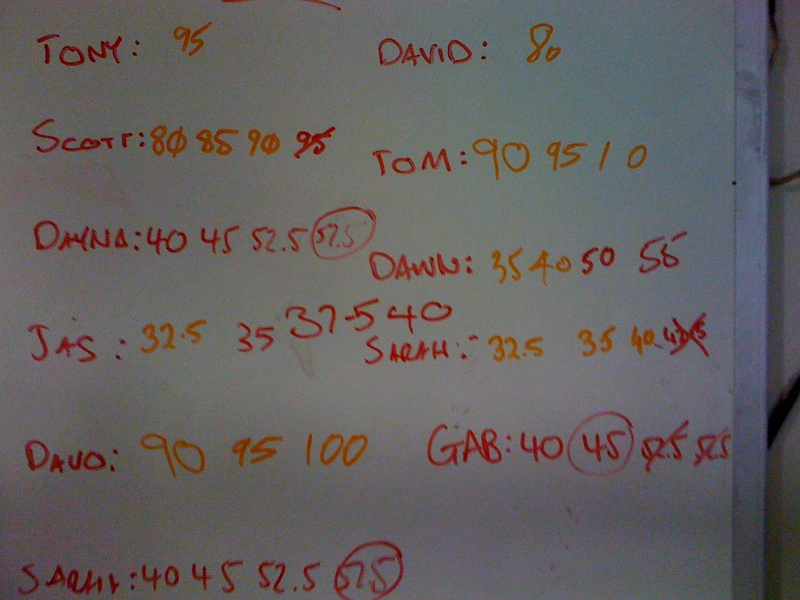 The 10mins involved doing 3-4 reps of your chosen exercise on the minute, having me finish with a total of 40 Ring Dips. And that finishes another week at The Crossfit Chamber. Looking forward to another big one next week with Chad and the team. This entry was posted on 18 February, 2011 by Fairy. It was filed under Crossfit, Fitness and was tagged with crossfit, Elizabeth, fitness, The Crossfit Chamber, WOD.